Erickson Cemetery. I remained on the farm until 1973 at which time I moved here to the Parkland Home in Erickson. I enjoy being a part of the Perky Pioneers, Hospital Aid and all activities in the home. Melvin married Jennifer (Jean) Marie Stadnyk of Shoal Lake, Manitoba on December 7, 1957 in Erickson Lutheran Church. Their eldest son, Mitchell Ward, born in Killarney, October 4, 1958. Mitchell started school at Erickson. On October 13, 1979, Mitchell married Deborah (Debbie) Jean Chapman of Winnipeg in the St. James Anglican Church, Winnipeg. They reside in Winnipeg. Tracy Lynn was born in Erickson, January 13, 1960. Tracy also started school in Erickson. Malcolm Grant was born in Brandon, August 27, 1961. Kirstin Leah was born in Winnipeg, April 18, 1967. Marshall Scott was born in Winnipeg April 17, 1968. Heather Dawn was born in Winnipeg September 27, 1971. Melvin and Jean, Mitchell, Tracy and Malcolm lived in a house trailer travelling with Veterans Construction in the summers. Jean was head cook. In winter the equipment and trailer were parked at the farm until 1965 when they moved their trailer to Erickson, east of the Gold Nugget. Melvin sold out of Veterans Construction Limited in 1966. They then moved to Winnipeg where Melvin was employed by Kane Equipment Limited. He went into partnership in 1972 until 1981 at which time they closed Kane Equipment Limited due to the recession. in the Swedish dance group of which Melvin is the leader. Since 1976, their second home is their cabin at Otter Lake Resort. Clifford married Margaret Thelma Benson of McCreary on September 4, 1965, in McCreary Knox United Church. Their daughter Ruth Johanna was born in Hartney July 17, 1966. Their son Clifford Kristian was born in Minnedosa November 17, 1967. 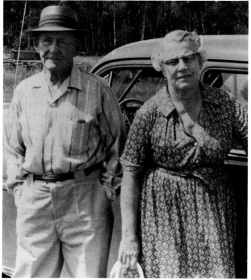 Clifford and Margaret lived in a house trailer, travelling with Veterans Construction. The winter of 1965-66 was spent at Mile No. 53 of the Snow Lake road where camp was set up. There were mornings in January when the temperature fell below -60F. In the fall of 1966, Clifford, Margaret and Ruth lived at camp in George Woloshen's yard before moving the trailer home to the farm. The equipment was also parked at the farm for the winters until 1970 at which time Veterans Construction equipment was sold. Purchasing the farm, Clifford converted the barn and started Chinchilla ranching. (see Fur Farming) In 1972, Clifford began employment with Bradley Sand and Gravel Limited of Brandon as a dragline operator where he is presently Superintendent and Gravel Consultant. Clifford was on the Board of the Curling Club, Recreation Commission and the Fair Board. He is presently in Erickson-Onanole Minor Hockey Association, Coach and Manager of a team. He has been a member of the Erickson Flying Club since 1976, President 1983. He received his Pilot Wings from Maple Leaf Aviation of Brandon in 1978. Melvin, Margaret, Clifford and Jean Eden.